I have been holding out on everyone to do the big reveal of my dining area in our house......but I decided I could give you all a sneak peak! The Duck and I built this banquette ourselves and I have to say, it was a lot easier than I had expected. Step 1: First we took some 2 x 4's and built a base to put the unfinished upper cabinets we bought from Lowe's onto. Instead of upper cabinets, we used them as the base for our bench. We were going to build these from scratch but surprisingly it was way less expensive to buy the cabinets pre-made. Roughly $60 a cabinet. A standard seat height is roughly 18-20" and these cabinets we 12" high which was perfect....once you have added the 2x4 on the bottom. We were at the perfect height! After the base and cabinets were laid on top we leveled them using shims and adding some spacers in between to make the cabinets fit perfectly in our window area gap. After everything is leveled and seems right you can go ahead and put the 3/4" plywood on top. We used a paint grade oak so that it would paint up nice and pretty. Plus the cabinets were also a paint grade oak. The plywood was the hardest part because our walls were so un-leveled! The duck had to scribe the ply (which at this point, I stayed out of his way...I ain't that smart at maths)...to make sure it fit snugly against the wall. Even though he did a great job we still had to use TONS of painters caulk. Like I said our walls were REALLY uneven! After the ply top was on we added some trim and wood filled the holes. We painted the cabinetry the same color as our trim throughout the house. We used Dunn Edwards "White" which in my opinion is one of the brightest whites out there.. It makes everything feel glowy and gorgeous. This big ole honking banquette is 103"long and 36" deep, so we knew going in that the bulk of our cash was gonna be put towards the seat and back cushions. Let me tell you folks...this part wasn't cheap, But it needed to be right! We have a monkey who has to be ON everything so we knew durability was key. Plus we have a lot of guests, which translates to a lot of butts sitting on the furniture. I used a pre-washed white denim for the fabric. I did a 4" thick cushion with a self welt. This required 14 yards of denim for the seat and back cushions. Here is a sneak peak at what my dining area is looking like currently. I am still workin on it so a sneak peek is all your gonna get. If you can't figure out what your lookin at....its my dining table with a suzani runner....dining chairs and the banquette with some new pillows!! Enjoy!!! Oh my goodness Amber- it looks SOOOO good- I can't believe you put that together yourselves- seriously gorgeous!!! Oh my gosh, I'm dying from just the small reveal that you shared with us....it looks amazing!! Stunning!! I can't believe its a DIY. 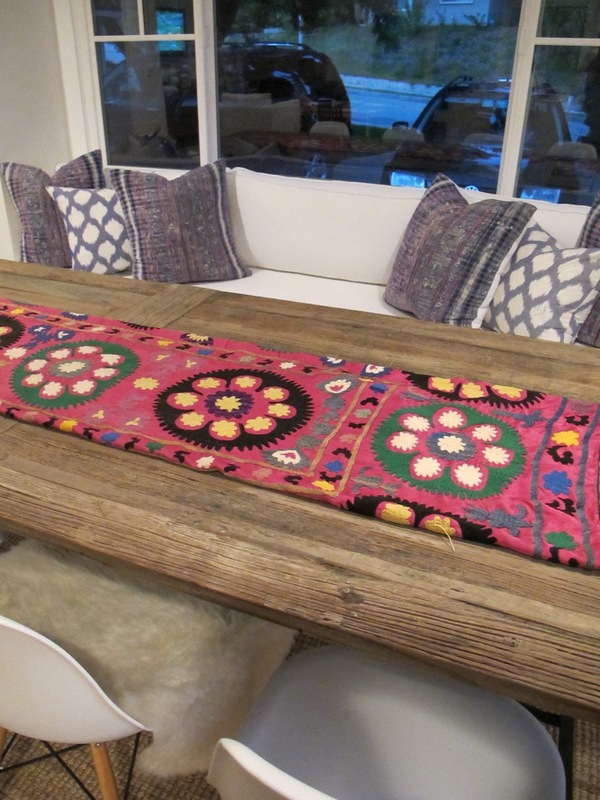 Also love the table runner. ahhh, i love everything you do. You are incredibly good! I so wish I owned a home or stayed put in a house for a while to all sorts of projects. Can't wait to see the big reveal! Looking GOOD!!!! It looks awesome!! I love the bench with the chairs on the other side! I can't wait to see the full reveal, LOVE everything about the sneak peek!! Amber! I've said it before, but I'll say it again...so happy to know your blog! :) What a beautiful job! And, I just read what you wrote about Japan, it's horrible, but I love having my blogs as the escape from all the awful stuff in life sometimes, so I'm glad you took the "business as usual" route! You're so talented, just love this! Would love to get more details on the cushions, as we're about to tackle a similar project (the seat is already there though so that's much easier.) Did you make them yourself -- what type of foam did you use? I'm very concerned about having something sturdy and comfortable, and not flimsy. Thanks!